A µProcessor controlled, sub-audio frequency signalling processor to provide an out band audio and digital signalling facility for PMR radio systems. Continuous Tone Controlled Squelch (CTCSS) tones and other non-standard sub-audio frequencies. Non-Return-to-Zero (NRZ) data to facilitate Continuous Digitally Coded Squelch (CDCS/DPLTM) system operations. A non-predictive CTCSS Tone Decoder and CDCS sub-audio signal demodulator. A CTCSS/NRZ Encoder with Tx level adjustment and lowpass filter output stage with optional NRZ pre-emphasis. A selectable sub-audio bandstop filter. A Notone (CTCSS Rx) period timer. 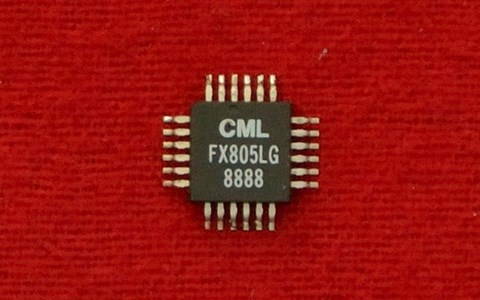 The setting of the FX805 functions and modes is by data loaded from the µController to the controlling registers within the device. Reply Data and Interrupt protocol keep the µController up to date on the operational status of the circuitry – all via the “C-BUS” interface. CTCSS tone data for transmission is generated within the µController, loaded to CTCSS Tx Frequency Register, encoded and output as a tone via the Tx Sub-Audio Lowpass Filter. Received non-predicted CTCSS tone frequencies are measured and the resulting data, in the form of a 2-byte data word, is presented via the CTCSS Rx Frequency Register to the µController for matching against a ‘look-up’ table. Noise filtering is provided to improve the signal quality before measurement. NRZ coded data streams for transmission, when generated within a µController, are loaded to the NRZ Tx Data Buffer and output, in 8-bit bytes, through the Lowpass Filter circuitry as sub-audio signals. CDCS turn-off tones can be added to the data signals by switching the FX805 to the CTCSS transmit mode at the appropriate time. NRZ coding is produced by the µController and translated into sub-audio signals by the FX805. Received NRZ data is filtered, detected and placed into the NRZ Rx Data Register which is then available for transfer one byte at a time, to the µController, for decoding by software. Clock extraction circuitry is provided on chip and Rx and Tx baud rates are selectable. Provision is made in both hardware and system software allocations to address two FX805 Sub-Audio Signalling Processors consecutively to achieve multimode, duplex operation. The FX805 has a power saving function which may be controlled by software or a dedicated (Wake) input. 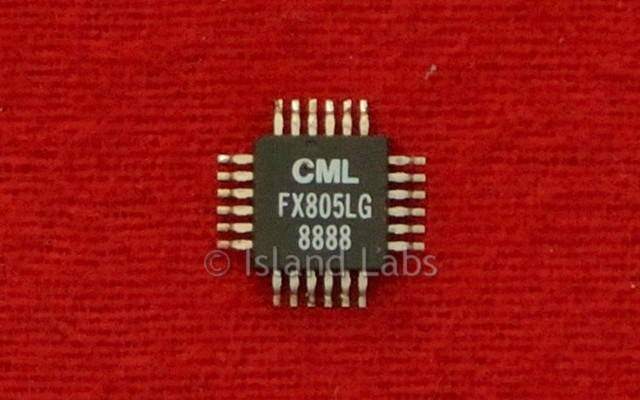 The FX805 is a low-power, 5-volt CMOS integrated circuit and is available in 24-pin DIL cerdip and 24-pin/lead plastic SMD packages.